Since Norman Osborn’s return to life at the end of “The Clone Saga,” there’s been some confusion about what to do with the character. His goblin mantle had been filled in his absence by both his son Harry and the mysterious (or at least very illusive) Hobgoblin. While he has returned to the Green Goblin a few times, there always seems to be something of a caveat to its presence. He’s also taken on other identities, serving for a time as Marvel’s answer to Lex Luthor, a ruthless business man with no true secret identity, then as a twisted “savior” as the Iron Patriot, and then finally as the leader of an army as the Goblin King. His latest identity, born from the pages of Amazing Spider-Man #799, is that of the Red Goblin. Red Goblin is about as clear-cut an example of escalation is serialized fiction as you can get. He’s the combination of Spider-Man’s greatest foe, Norman Osborn, with the deadlier, more un-hinged spawn of another of his greatest foes, Venom, all in a dark reflection of Spidey’s own time as host to the Venom symbiote. Hey, when you get to issue #800, you kinda have to pull out all the stops, right? 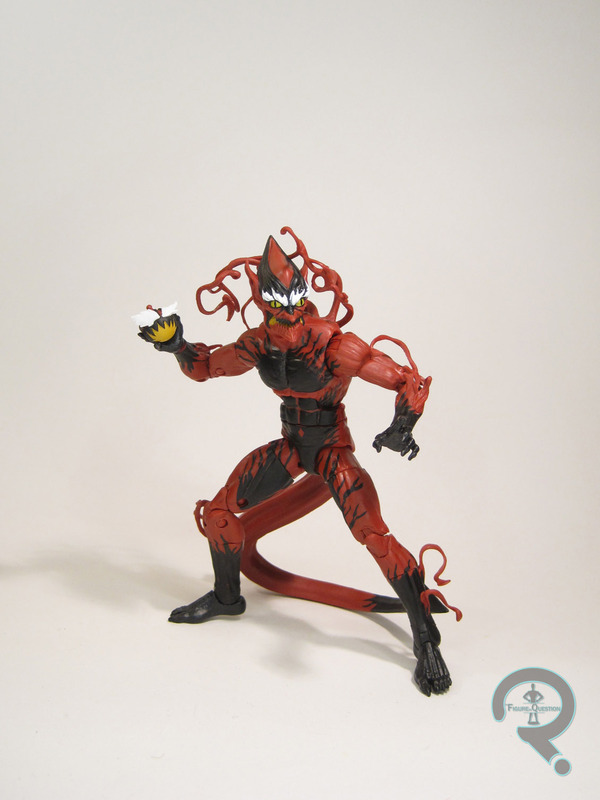 Red Goblin is figure 6 in the Kingpin Series of Marvel Legends. He’s the final single-packed figure in the assortment, and the only of the individuals to be a clear-cut villain. He also marks the second quickest turnaround from page to plastic in this assortment, being beaten out only by the Symbiote Spider-Man created to stop him in #800. The figure stands 6 1/2 inches tall and has 32 points of articulation. Like the last version of Norman, Red Goblin is built on the Bucky Cap body. 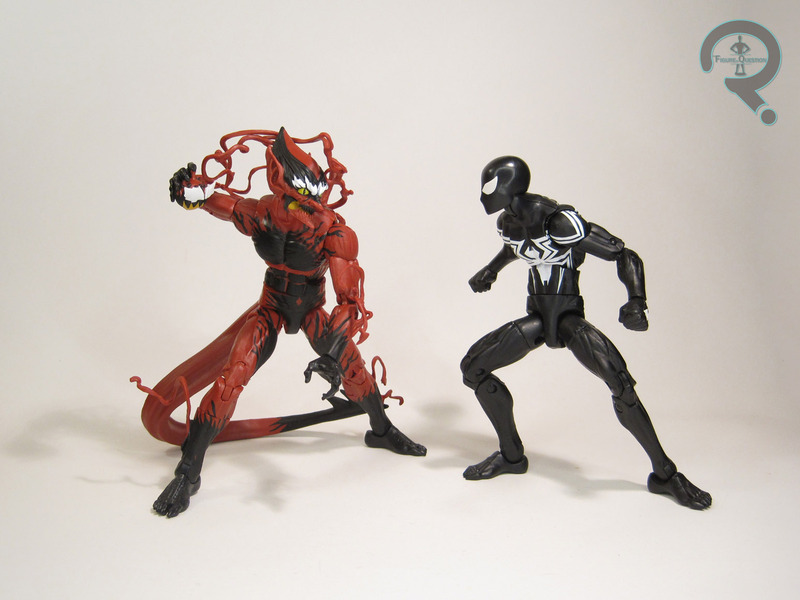 He makes use of Carnage’s tendril-ridden lower arms and legs, as well as his tendril back-pack piece, a sensible bit of re-use, since it’s the same symbiote and all. He also uses Superior Venom’s feet and 2099‘s hands for properly clawed appendages. Red Goblin is topped off with a brand-new head sculpt and a tail that’s been stuck to the back of the basic Bucky Cap pelvis. The Red Goblin design is one that’s very dependent on specific lighting and a fluidity to the design, and because of this, it’s a design that’s not ideal for translation to toy form. This is evident in the sculpt, and how it looks when viewed from most angles. The head looks downright comical when viewed straight-on, like an old toothless man. Also, as versatile as the Bucky Cap body tends to be, I wouldn’t say it really lends itself to “fluid”. It’s a more realistic, balanced physique, so you throw a cartoony looking head on there and the head just looks even more cartoony. Not helping matters is the tail, which is a big, solid chunk of unmoving plastic. I can kind of understand Hasbro’s hesitance to do bendable appendages, with the long term issues that can plague them and all, but on a figure like this, it’s really limiting his play value, and ends up looking downright silly just sitting there in the exact same pose no matter what you do with him. Furthering the issues with translating the design into three dimensions? The paint. They tried. They really did. They’re clearly taking a page out of the Carnage playbook with how they handled this, but it just doesn’t work as well with this particular design. The black sections just look kind of random and blotchy, and there’s too much un-broken red between them to make it look convincingly like the symbiote is in motion. The hands and feet being solid black also looks goofy, because it kind of looks like he’s running around with opera gloves and some toe-socks. It’s undoubtedly too clean and too collected, and, again, it just ends up looking comical. Maybe he’d look better molded in slightly translucent plastic? Or something with various colors injected in? It’d be an inconsistent effect to be sure, but I think that would only further help the figure. He just needed something better than all the solid colors we see here. Red Goblin is a rather sparsely packed figure, with only a single Carnage-infused pumpkin bomb. No glider, which seems kind of criminal with any Goblin figure. He’s also packed with the right leg of Kingpin, which is, without a doubt, the best thing he’s got going for him. I’ve long felt that Norman Osborn was the sort of character that was better off dead. Apart from a few decent stories here and there (the Goblin King angle was one I liked), he’s felt like he’s sort of out of place. I appreciate the Red Goblin concept for what it is, but I can’t say I was that invested in it, nor was I that crazy for a figure of the design. Having the figure in hand, my feelings really haven’t changed. He just doesn’t work as a toy, and I struggle to find much to like about him. I appreciate their attempt to be timely with this release, and he pairs off alright with the Symbiote Spider-Man, but he’s ultimately just not very well-made, and a very clear weak point in the assortment. Red Goblin was purchased from my friends at All Time Toys. He’s currently in-stock at their webstore. If your looking for other Legends or other toys both old and new, please check out All Time’s website and their eBay storefront. Any long running line encounters the risk of making latecomers feel like they have an interminable game of catch-up to play to grab classic versions of major characters. Sure, someone collecting from day 1 might have all the classic Iron Men they’ll ever need, but little Johnny who just got in at Wave 75 isn’t so lucky. Fortunately, DST had a great way of handling this: Best Of Marvel Minimates. 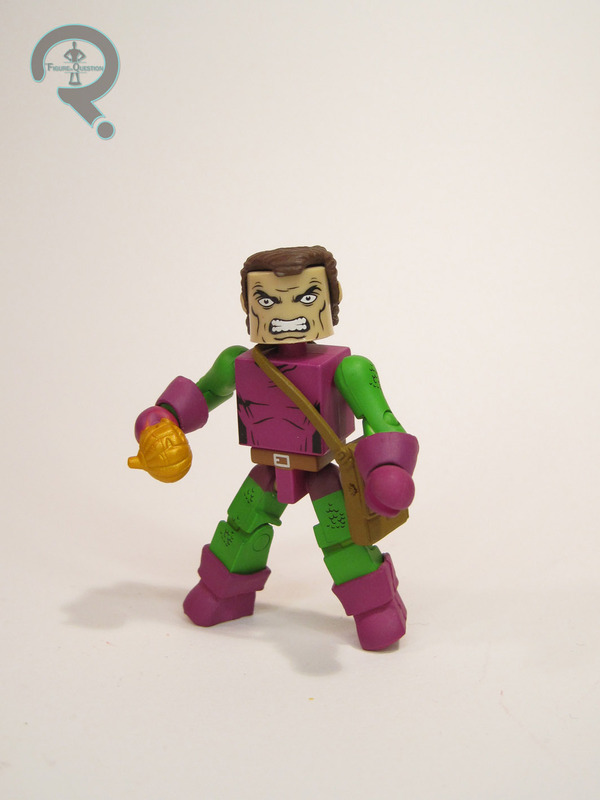 The idea behind this sub set was keeping the definitive versions of the main Marvel Heroes and villains on the market, while trying to produce the best possible Minimates of those looks. And, really, can you possibly get more “Best Of” than definitive takes on Marvel’s best known hero and is greatest foe? I would say you can’t, sir. 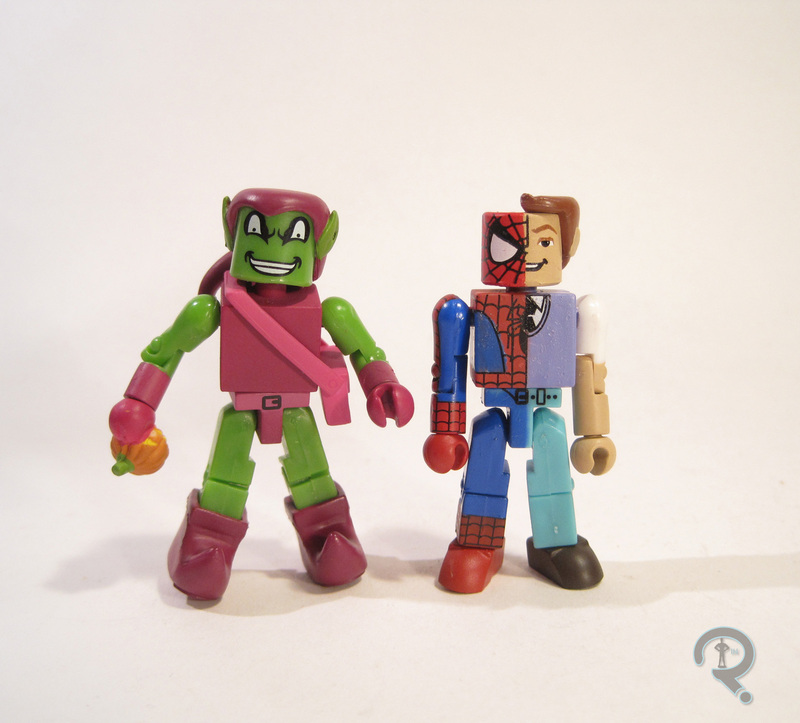 Spider-Man and Green Goblin were released in the first series of Best of Marvel Minimates. Whooo boy have there been a lot of Spider-Man Minimates. This one here was the 44th of them. He’s a return to the classic red and blue, as you’d expect from something intended as the definitive take on Spidey. If you want to get really technical, he’s a late ’60s/early ’70s Spidey, as denoted by the shape of his eyes and the presence of web wings under his arms. When it comes to construction, Spider-Man has classically been a vanilla ‘mate, but that’s not the case with this guy. He has a unique set of upper arms, which incorporate the previously mentioned web wings. These were a recurring feature of his costume for quite some time before quietly disappearing, but for the most part they’ve been absent from toy versions of the webhead. The reason is fairly simple: they’re hard to translate. That’s as true here as it is on any web-winged Spidey. They’re decently sculpted, and look fine from a basic standing pose, but you try to pose the arms, and they’re going to start looking a little goofy. They’re a nice idea, and they aren’t awful to look at, but perhaps they would have worked better as a set of spare arms? Spider-Man’s paintwork is, as always, doing the heavy lifting. The detailing on the mask and the torso in particular is very strong, and his color scheme is bright and quite striking. Sadly, he’s a little marred by some missing weblines on his gloves and the sides and backs of other sections of his costume, which is a little bit of a let-down. This was a trend that had been going on for a little while at the time of this figure’s release, though, so it’s not as if he was the first example; just an unfortunate victim of changing styles and budgets, I suppose. 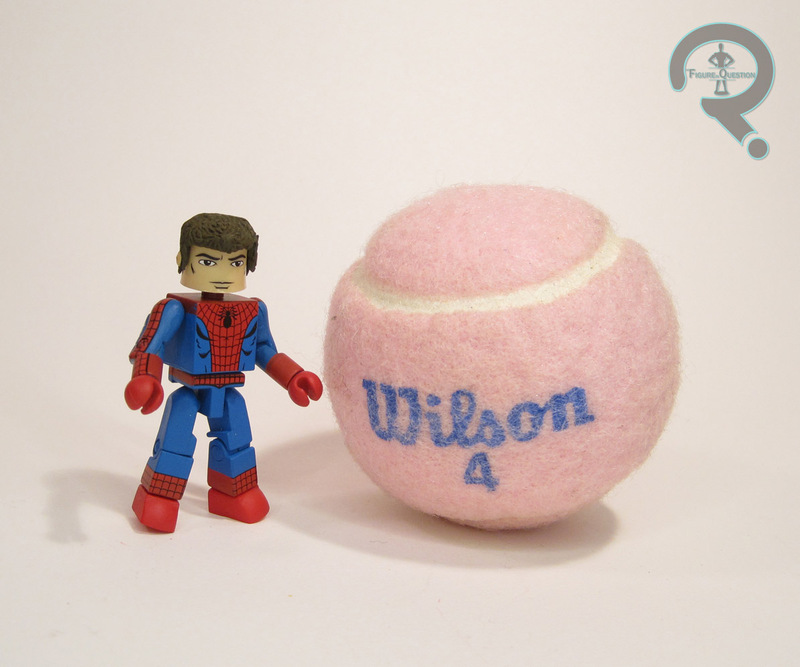 Spider-Man was quite well accessorized, including a the usual webline accessory, as well as an extra head and hair piece for an unmasked Peter Parker, and a clear display stand. The head and hair are the best extra of the bunch, as it finally signified a move away from trying to use removable masks to give us the Peter Parker look. 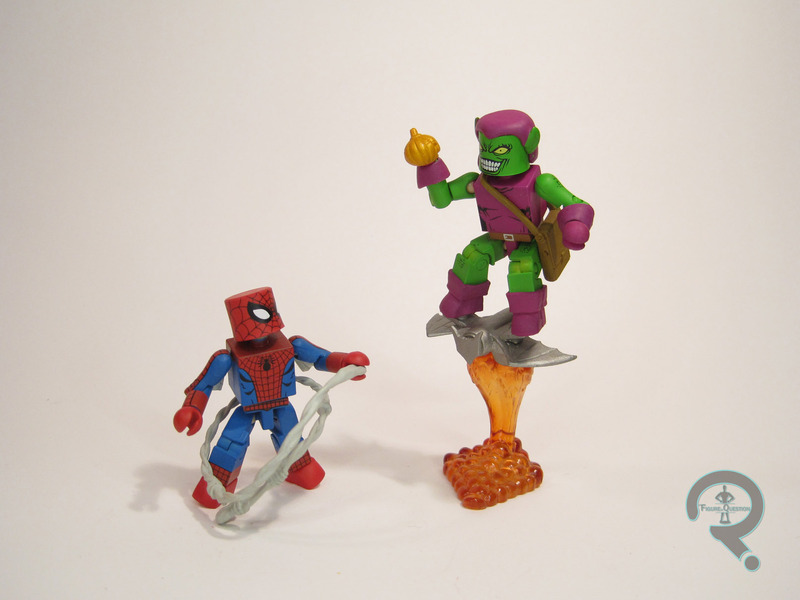 Compared to his wall-crawling foe, Green Goblin is a far lest frequent inclusion in the Minimates line. This marked only his fifth time as a Minimate, and six years later, it’s the last standard Goblin we’ve gotten. Goblin represents his classic look, but is a more amalgamated, less era-specific look than Spidey (we had just a few months prior gotten a pretty fantastic Silver Age Goblin, so it was an acceptable choice). The figure uses mostly the same selection of parts as his Series 41 counterpart, who in turn was using a lot of re-used parts from other figures. The hat/ears is the same piece that’s been used since the old Series 2 version; it’s the epitome of “if it ain’t broke, don’t fix it.” It works. He gets the improved flared gloves introduced in the Cap Through the Ages set, as well as the cuffed boots from the Invaders set. The really notable change for this figure is the satchel. After using the same Series 2 piece for a decade, they finally upgraded Goblin’s bag this time around, and gave him Kim Bauer’s purse, which actually works quite well. Goblin’s paintwork is pretty standard stuff. The colors are definitely the best palette of any of the Goblins we’ve gotten, and his detail line work is solid. The mad grinning face looks suitably intimidating and is reliably different from his previous ‘mates, allowing for some variety. Like Peter, Goblin is pretty well accessorized. He too gets an extra head and hair for an unmasked look, as well as a spare hand with an attached pumpkin bomb, a goblin glider, and a flying stand for it to plug into. Though I wasn’t initially planning to get in on this line, having followed Marvel Minimates since its very beginning. But, upon seeing this pair in person at Cosmic Comix back when they were new, they just really spoke to me. Best Of Spider-Man is a solid ‘mate. A really, really good stab at a major character, and undoubtedly one of the best takes on the character housed within this line. He is, however, held back slightly by one or two iffy design and cost choices, that perhaps keep him from being the best that he can. Coming so close to the Series 41 version, there was a good chance for this release of Green Goblin to be redundant, but he takes what was improved on that figure and adds even more to it, and truly creates the best Green Goblin to date. Hello and welcome to another Friday at the Figure in Question! It’s time for another Flashback Friday Figure Addendum! 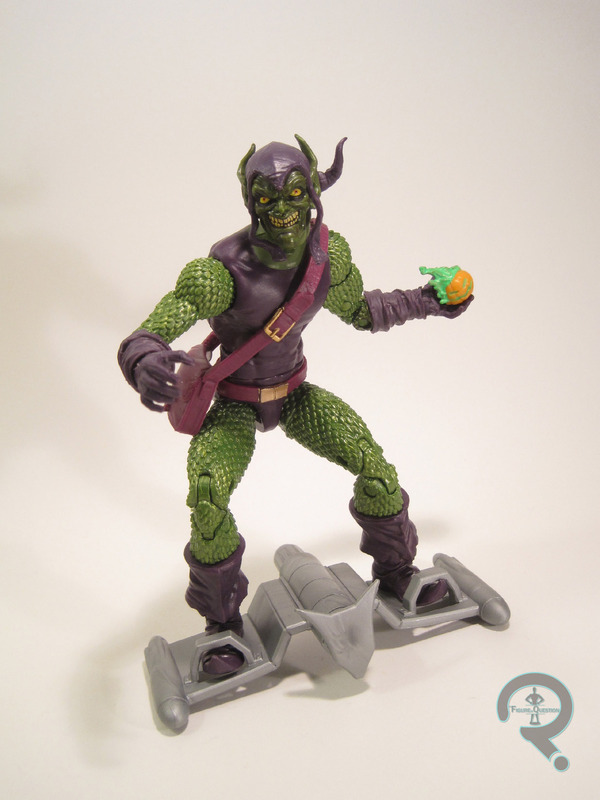 Today, I’m taking a look at another Green Goblin figure, specifically the one from the ‘90s Spider-Man line. This is from back *before* he was Willem Dafoe. Alright guys, after a brief stop over into the strange bizzaro world of The Stapler in Question, we are back at home with the action figures. Yay! So, back in the 90s, the 5-inch scale Marvel figures, produced by the very much at the height of their game ToyBiz were totally my jam. The figures were (at least loosely) based on the then current cartoons. Amongst those cartoons was Spider-Man: The Animated Series, which ended up with a fairly nice toyline of its own, at least for a few series. 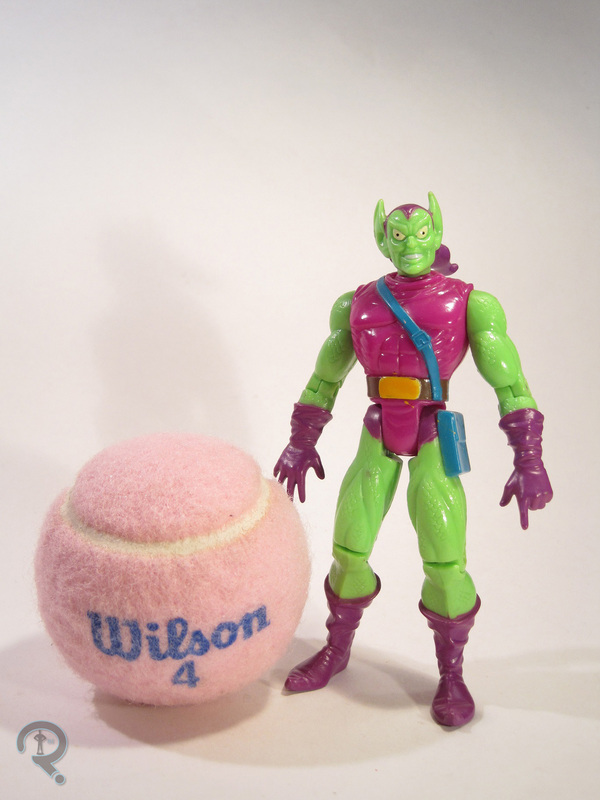 So, let’s have a look at one of Spidey’s greatest foes, the Green Goblin, as he was presented in said line. 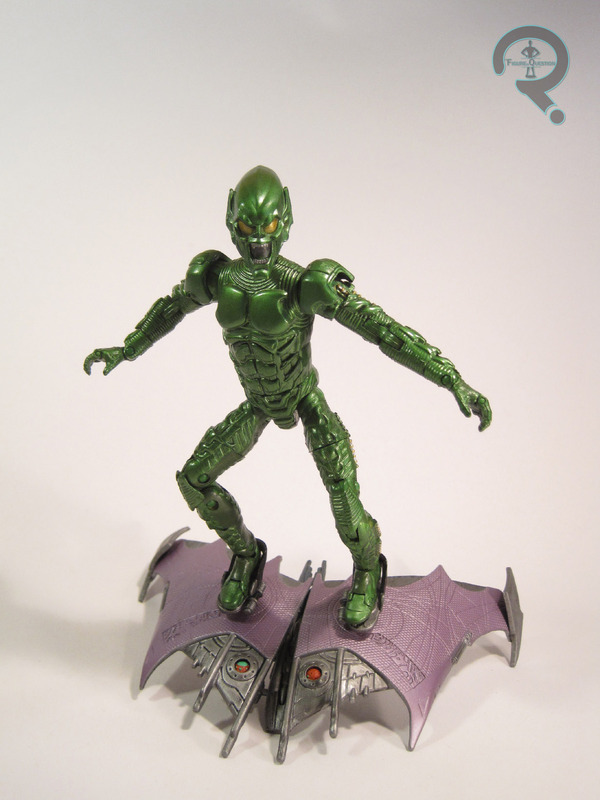 Green Goblin was released as part of Series 3 of ToyBiz’s Spider-Man line. The cartoon did this odd thing where Hobgoblin preceded Green Goblin, which resulted in Hobs taking the Goblin slot in Series 1. And Goblins never go for even numbered series. That’s just not how they roll. The figure is about 5 inches tall, with 9 points of articulation. He’s pretty much standard for a ToyBiz figure of the time. He’s based on the character’s animated appearance, which itself was a fairly faithful recreation of the comics design. Mostly, it just comes down to style cues, resulting in a slightly “friendlier” looking Goblin. 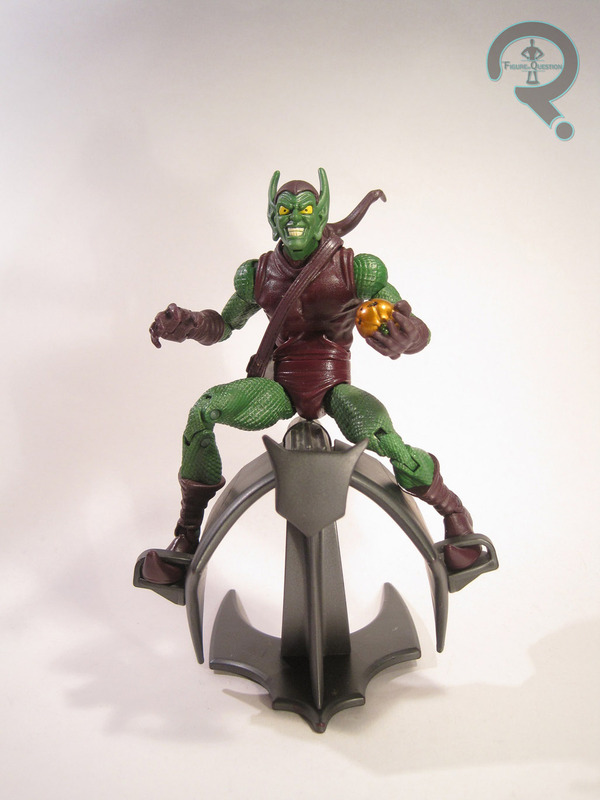 Surprisingly, Green Goblin got his own sculpt, which shared no pieces with Series 1’s Hobgoblin. I think that may be the only time these two have both appeared in a line with no re-use at all. Impressive. The sculpt itself ends up being quite impressive, with not only some pretty good proportions, but also some killer texturing, especially on the scaly arms and legs. They aren’t super-detailed like some of the sculpts that followed, but they are a great example of using just enough detail to suggest the rest (which, incidentally, is how Goblin was drawn for most of his classic appearances). Also, it’s an odd thing to point out, but this figure has some of the best hand sculpts of any figure from this time. Most were molded in a generic clasping positon, but Goblin has one splayed as if it’s just thrown a pumpkin bomb and one in a pointing position. I don’t know what he’s pointing at, but at least it’s different. Goblin’s paintwork isn’t quite up to the same level as the sculpt, but it’s pretty much on par with just about everything else being offered at the time. The colors match up pretty well to the show’s design. The colors don’t so much match up to themselves, however. The purple ends up changing a few times over the course of the figure, which is rather distracting. There is also some rather noticeable bleed over around the edges of the gloves and boots, and the edges on the shorts aren’t even close to being even. Green Goblin included his faithful goblin glider (which even launched missiles) and a pumpkin, but pesky child-Ethan lost them! As into the ToyBiz Marvel stuff as I was as a kid, I actually ended up avoiding a lot of the Spider-Man line. The cartoon never really gripped me like the others, so I just never really had the connection. So, Goblin here wasn’t part of my “initial collection.” He was a later acquisition, fished out of a bin of low priced figures at a nearby comic book store sometime around the mid-00s. I don’t know exactly why I picked him up, but I imagine I was just filling in some gaps in the collection at low prices. Going back to review this guy, he surprised me. With most of the 5-inch figures, the nostalgia filter is firmly in place, but not for this one, and yet he still impressed me. That really says something. Ah yes, this was the first review following 2015’s “Stapler In Question” gag, which was my second April Fools Day post. I had originally pegged this figure as the subject of that year’s gag post, but I couldn’t come up with any good gimmicks, so he was pushed back a day, and the Stapler replaced him. My review for this guy was pretty on point. I had thoroughly shaken the off slump that plagued a chunk of my 2014 reviews, and was back to having some more fun with the writing again. It probably helps that he immediately followed my SiQ review, which really reignited my writing spirit. It should be noted that this was my second-to-last review to be published using one of my old catalogue shots. He still had a Wilson photo I’d shot later, but I apparently deemed the original lead photo as “good enough.” Not something I’d do nowadays, or even a month after for that matter. Missing from my original review were his Goblin Glider and pumpkin bomb. They cropped up during The Find. Still don’t have the glider’s missiles, and technically there should be a second bomb, but I’m calling this close enough. The glider is a little on the flat side, but not a bad piece for the time, and it’s honestly not noticeably worse than any of the other pack-in gliders we’ve gotten (barring the Famous Covers one, because that thing is goddamned perfection). The pumpkin bomb could actually plug into the base of GG’s right hand, allowing for some pretty sweet posing options. Nice forethought on that guys! I was pleasantly surprised by this guy when I reviewed him the first time, and I’m still surprised by how much I like him now. And, as an added bonus, he’s even more complete! Oh yeah, it’s Friday! 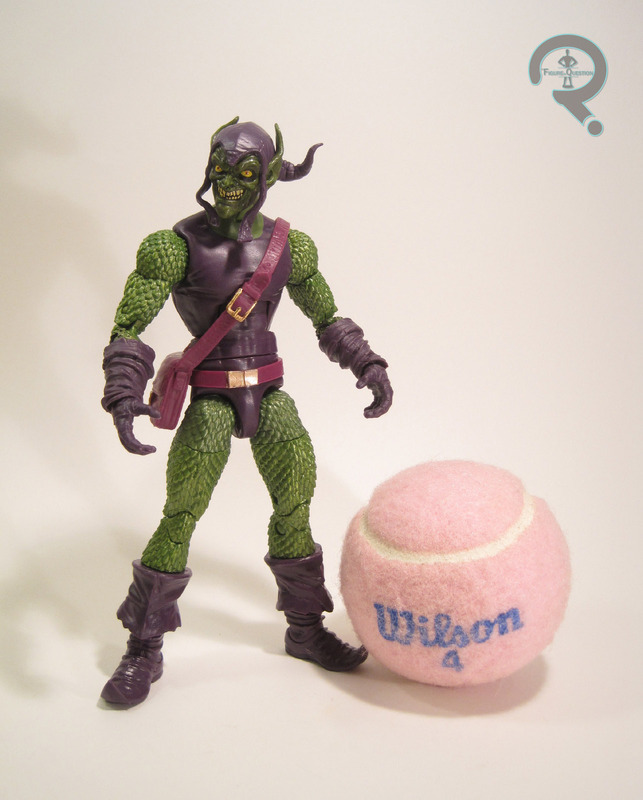 You know what that means: it’s time for another installment of Flashback Friday Figure Addendum! Today, we flip back over to the Marvel side of things, with long-time Spidey foe Green Goblin, from back when he was Willem Dafoe! 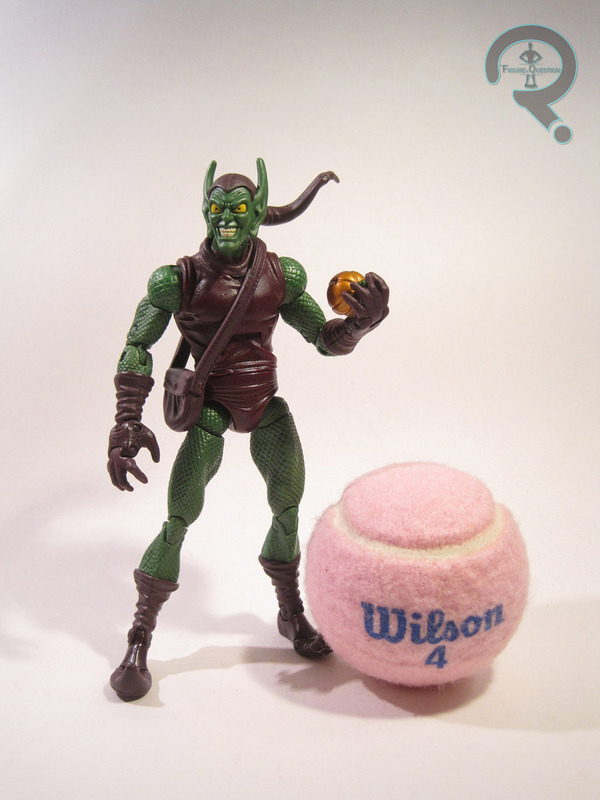 The Goblin was part of the first series of Spider-Man movie figures. The figure stands 6 inches tall and features 38 points of articulation. He has an all new sculpt based on Willem Dafoe’s performance as the character in the film. It’s a pretty good sculpt and, whether you like the suit or not, it’s a good representation of the suit’s design. 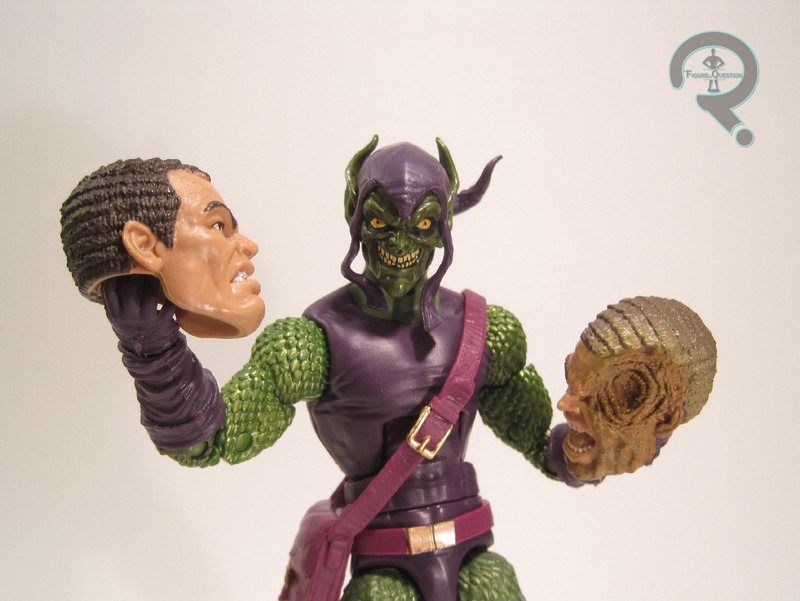 Under the figure’s removable mask is an unmasked Norman Osborn head, which bares more than a passing resemblance to Dafoe. The resemblance might be a bit closer were it not for the slick back hair style, but it was necessary in order to facilitate the removable mask feature. The mask is a well done piece and is essentially a scaled down version of the real thing, though it is missing the backing it had in the movie. This is once again to aid the removability. The paintwork is cleanly applied, with no real issues with slop or bleed over. His skin tone is a tad too yellow for my tastes, but only a tad. The figure came packaged with his goblin glider and a flight stand, but both of mine have been lost. Sorry! Okay, so first of all, I feel the need to apologize for the complete lack of a shot of his unmasked face in the original review. I’m not sure how that got completely left out. 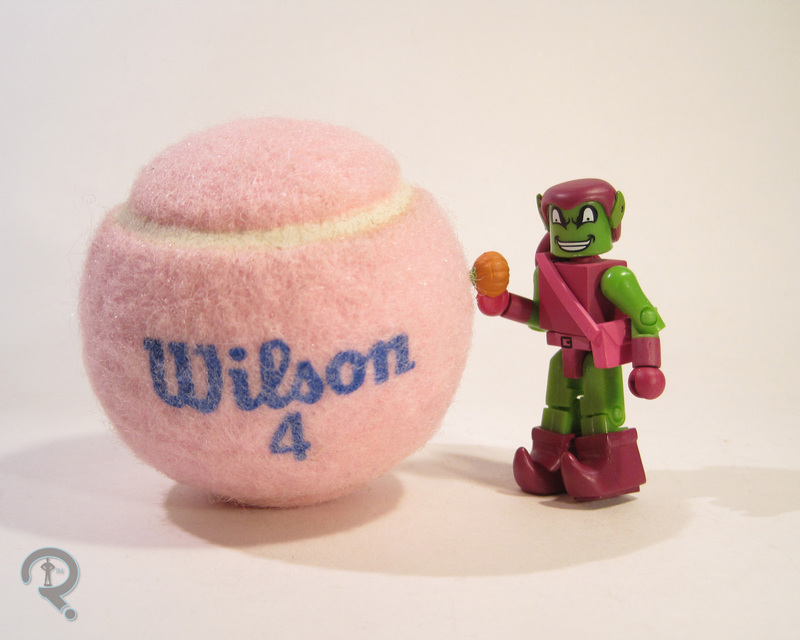 It’s now been added as part of his Wilson photo. This was another short review, though it does hit on most of the major points. Perhaps I should try for brevity more often? Nah, that’s silly! Anyway, as nice as the actual details on the costume are, the actual body they’ve been placed on is rather oddly proportioned, and suffers from a lack of any useful articulation on the torso. Still, he’s on par with most of the early Marvel Legends and Spider-Man Classics, so he’s not awful. Missing from my original review was his Goblin Glider, which I discovered during The Find. It was actually split between several different boxes, so finding the whole thing was quite an accomplishment. It’s honestly one of the best parts of this figure. There’s a ton of detail and it’s not undersized like so many of the gliders end up being. There’s even some slight articulation, so you can get him posed on it just right. This guy feels a lot more complete now. His design’s still really, really goofy, but this was a pretty fun figure for its time, and it was honestly the best Goblin Toy Biz put out until the Series 13 Legends release. The line may have made it well past 60 series, but Marvel Minimates had rather humble beginnings. It started with three series, each centered on one of Marvel’s hottest properties of the time. Since there was no guarantee of anything past those three series, quite a few heavy hitters made appearances. The figures were also a lot more simplistic than they are now, making for a very different product. Let’s jump back into the old days of the line with Green Goblin and Peter Parker/Spider-Man. 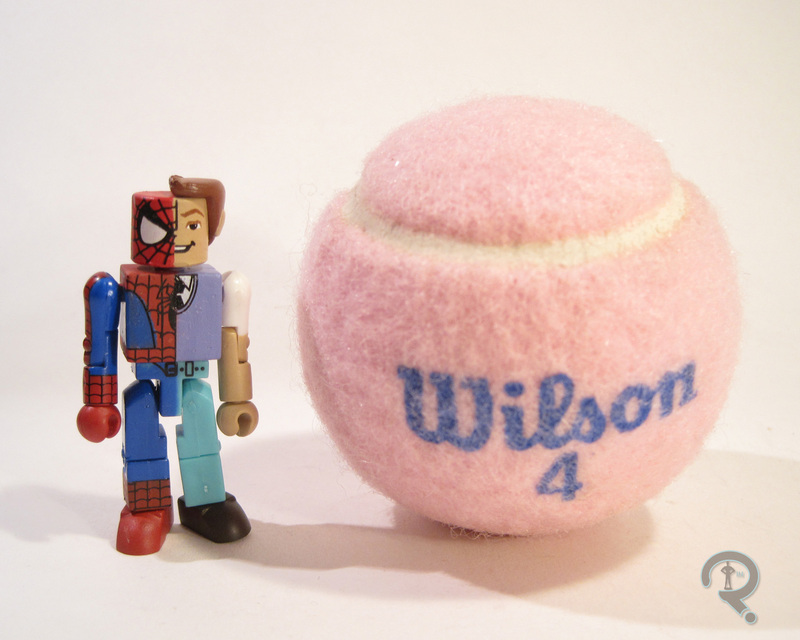 This pair was released in the second series of Marvel Minimates, which was also the first series to be Spider-Man themed. It was far from the last. You certainly couldn’t bring Spider-Man into Minimates without his greatest foe (aside from Aunt May’s health), Green Goblin! Goblin is presented here in his classic incarnation, pointy shoes, man-purse, and all. The figure is roughly 2 ½ inches tall and he has 14 points of articulation. He’s built on the older Minimate body, which is more or less the same as the current body, with the exception of the longer feet, which are just downright odd to see nowadays. The longer feet are actually hidden by a set of larger boot pieces, which were done in a slip on fashion here, rather than just being a unique sculpt as they would be now. The figure also features add-on parts for his hood/hat thing, a hand holding a pumpkin bomb, and the previously mention man-purse. All of these parts are pretty well handled, and they add up to a pretty decent version of the character. Paint-wise, Goblin is fairly simple, with mostly flat color work. There’s a bit of slop here and there, but nothing too terrible. He has detail lines for his face and belt buckle, which are nice and sharp. The face is definitely more on the cartoony side, but it fits with the style of the time. 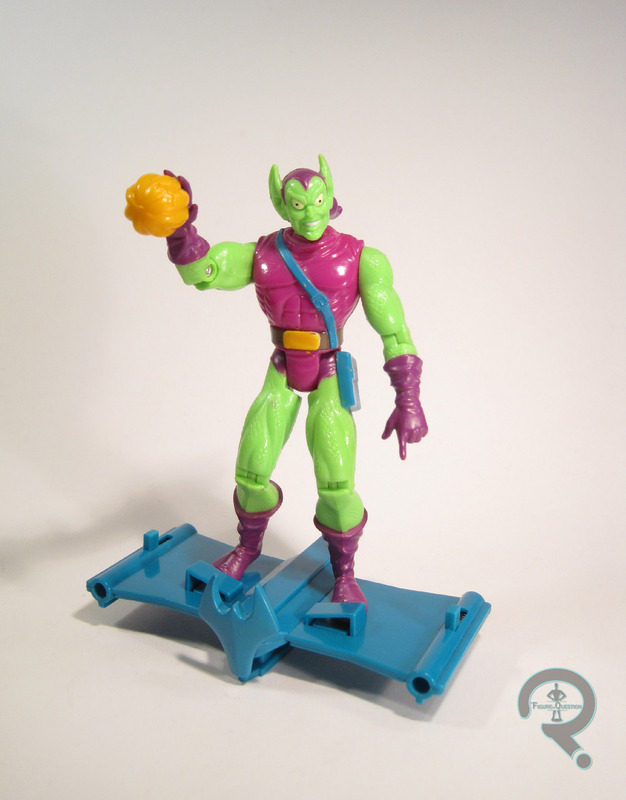 Green Goblin was packed with no accessories, since DST had yet to brave the goblin glider. Still, with the amount of sculpted pieces here, the lack of any extras seems reasonable. Given it was a Spider-Man series, it’s not really a shock that a Spidey variant found his way into this set. (In fact, Spidey was in every set in this series). This is probably one of the more unique figures from the series. It depicts Peter as he was sometimes seen, when his spider-sense would kick in while he was out of costume. Typically, it only showed up on his face, but I’m sure it manifested this way at least once. His lone unique piece is the hair for the Parker half of the head, which is actually glued in place, being that pegs had yet to be added on the hair pieces. It’s a perfectly fine sculpt, though it is, unsurprisingly, much more sparse on detail than the more current stuff. It ends up looking a little weird from any angle over than head on, but I don’t know that there’s a way to avoid that. The rest of the detail is handled via paint. For the most part, it’s pretty well handled. The biggest issue the figure faced was slop between the two halves, which gets pretty bad in a few areas. Some people weren’t fans of Peter’s goofy smile, but I kinda like it. Oddly enough, the Spider-Man half is painted in a different manner than the regular Spidey, so no parts were straight re-uses. 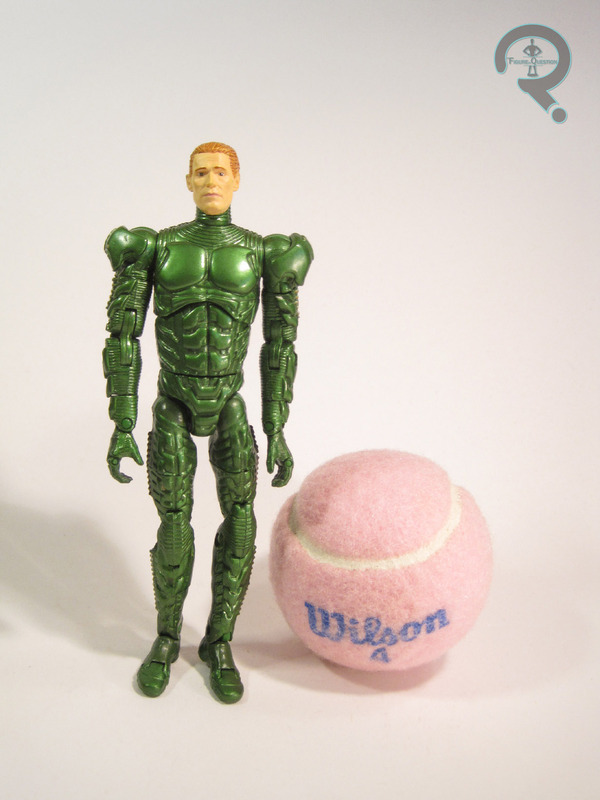 The figure included no accessories. This set was one of my earliest sets of Minimates. After getting the Yellow Daredevil & Elektra set, and thoroughly loving them, I went back for more, and this and Series 3’s Cyclops & Jean Grey jointly became my second venture into the line. This isn’t the best the first three series had to offer, but I’m pretty sentimental about these guys, even if they’ve become outdated next to newer releases.